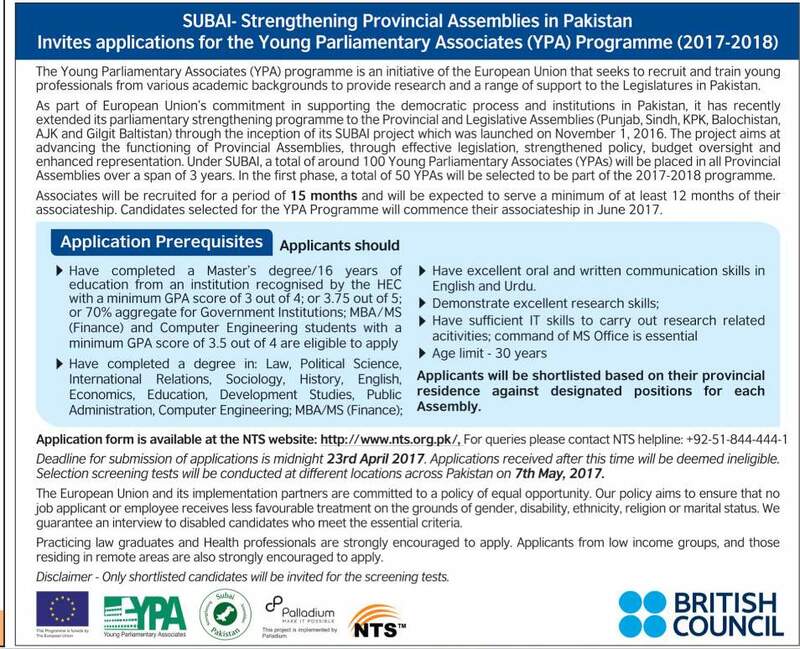 The Young Parliamentary Associates(YPA) Programme is sublime initiative of the European Union that seeks to recruit and train young professionals from various academic backgrounds to provide research support to the legislature in Pakistan. The SUBAI project aims to advancing the functioning of Provincial Assemblies, through effective legislation, strengthened policy, budget oversight and enhanced representation. Under SUBAI, a total of 100 young Parliamentary Associates (YPA) will be placed in all 6 provincial and legislative assemblies over a span of 3 years. This crucial responsibility of recruitment for Young Parliamentary Programme is being given to National Testing Service Pakistan in order to ensure the transparency throughout the process. NTS shall make arrangements for synchronization of candidates in terms of taking test and interview accordingly. Young Parliamentary Programme associates shall be recruited for a period of 15 months and will have to serve least 12 months of their associate-ship. Applicants will be shortlisted based on their Provincial residence against designated positions for each Assembly. Practicing Law Graduates and Health Professional are strongly encouraged to apply. Applicants from low income groups and belonging to remote areas are also encouraged to apply as well. Selected Candidates shall be awarded handsome stipend against their potential as well as intellectual services as will commence from the month June 2019. Candidates must have Master’s Degree / 16 years of education from recognized institution by HEC with a minimum GPA score of 3 out of 4, or 3.75 out of 5 or 75% aggregate or Govt. All those candidates who have completed MBA / MS (Finance) and Computer Engineering must have minimum GPA Score 3.5 out of 4 are eligible to apply. Those candidates who have completed a degree in Law, Political Science, International Relations, Defense & Strategic Studies, Sociology, History, English, Economics, Development Studies, Public Administration, Computer Engineering; MBA /MS (Finance) are liable to apply. Candidates must be excellent oral and written communication skills in English and Urdu with the best demonstration research skills are needed as well. Applicants should be having the IT knowledge to carry out the research work and command on MS Word is required to apply. Age limit for a an aspirant is 30 years. Applicants are required to apply online by visiting nts.org.pk/ . Application received incomplete or after the last date will not be entertained. No TA/DA will be admissible for appearing in Test / Interview. Last Date for submission of Application for Young Parliamentary Programme is 23rd April 2019. The test for Young Parliamentary Programme will be held on 7th May 2019 on Sunday. For getting more updates regarding list of eligible candidates, results keep in touch with us gotest.pk.